The impulse function, also known as a Dirac delta function, helps you measure a spike that occurs in one instant of time. Think of the spiked impulse function (Dirac delta function) as one that’s infinitely large in magnitude and infinitely thin in time, having a total area of 1. Impulse forces occur for a short period of time, and the impulse function allows you to measure them. 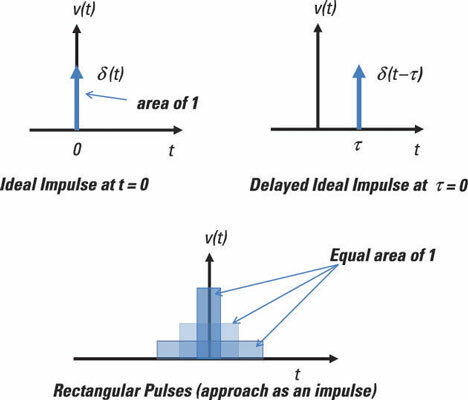 Visualize the impulse as a limiting form of a rectangular pulse of unit area. Specifically, as you decrease the duration of the pulse, its amplitude increases so that the area remains constant at unity. The more you decrease the duration, the closer the rectangular pulse comes to the impulse function. The bottom diagram here shows the limiting form of the rectangular pulse approaching an impulse. So what’s the practical use of the impulse function? By using the impulse as an input signal to a system, you can reveal the output behavior or character of a system. After you know the behavior of the system for an impulse, you can describe the system’s output behavior for any input. Why is that? Because any input is modeled as a series of impulses shifted in time with varying heights, amplitudes, or strengths. Some physical phenomena come very close to being modeled with impulse functions. One example is lightning. Lightning has lots of energy and occurs in a short amount of time. That fits the description of an impulse function. An ideal impulse has an infinitely high amplitude (high energy) and is infinitely thin in time. As you drive through a lightning storm, you may hear a popping noise if you’re tuned in to a radio weather station. This noise occurs when the energy of the lightning interferes with the signal coming from the radio weather station. Another example of a real-world impulse function is a bomb. A powerful bomb has lots of energy occurring in a short amount of time. Similarly, fireworks, including cherry bombs, produce loud noises — audio energy — that occur as a series of popping noises having short durations. This mathematical description says that the impulse function occurs at only one point in time; the function is zero elsewhere. The impulse here occurs at the origin of time — that is, when you decide to let t = 0 (not at the beginning of the universe or anything like that). The top-left diagram here shows an ideal unit impulse function having a large amplitude with a short duration. What these two equations tell you is that if you know one function, you can determine the other function. The area under the curve is given by strength K. The result of integrating the impulse leads you to another step function with amplitude or strength K.
This equation says the impulse occurs only at a time later τ and nowhere else, or it’s equal to 0 at time not equal to τ. You see a delayed impulse in the top-right diagram shown here. The equation says that the impulse, which has strength K = 10, occurs only at a time τ = 5 later and that the impulse occurs nowhere else. In other words, the impulse is equal to 0 when time is not equal to 5. You do this evaluation only where the impulse occurs — at only one point and nowhere else. The preceding equation sifts out or selects the value of x(t) at time equal to t0. This integration is one of the easiest integrations you’ll encounter. Pretty funky way to integrate analytically, huh? The integration leads to a delayed (or time-shifted) step function (or constant) starting at a delayed time of t0 = 5. This equation says you can break up any function x(t) into a sum of a whole bunch of delayed impulse functions with different strengths. The value of the strength is simply the function x(t) evaluated where the shifted impulse occurs at time τ or t.